Dr. Riordan (and others) recently published this case study demonstrating how amniotic tissue products promote wound healing. You can view the original article on the Journal of Translational Medicine website: Case report of non-healing surgical wound treated with dehydrated human amniotic membrane. Non-healing wounds can pose a medical challenge as in the case of vasculopathic venostasis resulting in a surgical ulcer. When traditional approaches to wound care fail, an amniotic patch (a dehydrated tissue allograft derived from human amnion) can function as a biologic scaffold to facilitate and enhance tissue regeneration and rehabilitation. Amniotic AlphaPatches contain concentrated molecules of PGE2, WNT4, and GDF-11 which have angiogenic, trophic, and anti-inflammatory effects on tissues that may be useful in enhancing wound healing. We present a case of a severe non-healing surgical wound in a 78-year-old male 17 days post right total knee arthroplasty. The full-thickness wound exhibited a mobile flap, measured 4 cm long × 3 cm wide, and showed undermining down to patellar tissue. We treated the wound conservatively for 6 weeks with no evidence of wound healing. Upon failure of the conservative treatment, two amniotic AlphaPatch (Amniotic Therapies, Dallas, TX, USA) were applied to the wound, and the wound healed completely in 10 weeks. In the OR, the wound was irrigated with three liters of double antibiotic solution under pulse lavage. Two dry amniotic AlphaPatch (4 cm × 4 cm) were placed over the wound with Acticoat applied on top. At the two-week follow-up visit (following the incision and drainage of the wound dehiscence and application of the amniotic AlphaPatch), a central scab had formed centrally in the wound dehiscence area. At the four-week follow-up visit, the wound dehiscence area had completely scabbed over with no open areas left. At the eight-week follow-up visit, the scab had just fallen off, and the wound was healing well with immature skin representing the size of a penny. At the ten-week follow-up visit, the wound was completely healed. Sterile, dehydrated amniotic tissue AlphaPatches (containing trophic factors known to enhance wound healing) have proven effective in completely healing an otherwise non-healing wound in a 78-year-old male who failed six weeks of conservative wound care treatment. RMI combines biologic cellular therapies with state-of-the art orthopedic options to postpone or eliminate the need for surgery, or augment a necessary surgery for faster healing. 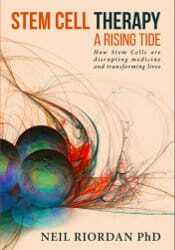 Learn how stem cells are disrupting medicine and transforming lives today buy reading Dr. Riordan's book about stem cell therapy today. Sign up for our newsletter to receive the latest information about stem cell therapy in orthopedics. We do not share email lists.